It’s an age-old adage that ‘big things come in small packages,’ and Liberty North High School senior, ex WFA Kansas City Titans QB and recruit for the Mile-High Blaze, Brooke Liebsch is no exception. 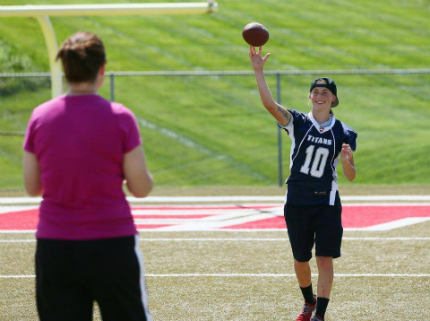 Brooke has been playing football with her male counterparts since she was 10-years old and became Missouri’s Liberty North High School’s first female quarterback at 14-years old. While playing with Kansas City Titans, Brooke credits Katie Sowers, NFL’s San Francisco 49ers assistant coach and the second woman in history to hold a full-time NFL" coaching position, as being her mentor and inspiration. Mile High Blaze General Manager (GM), Wyndy Dominy was instrumental in convincing Brooke to join the Blaze team. Larry Liebsch, Brooke’s father and avid supporter stated, “Wyndy was an instrumental force in Brooke leaving the Titans and moving to a more inclusive team culture.” Both Larry, Brooke and GM Wyndy believe Brooke can be a WFA 2019 1st Team All American and help lead the Blaze to the 2019 National Championship. In her spare time, Liebsch is already an entrepreneur, she owns a lawn mowing business with her father and is planning on hiring several employees as the business grows. Brooke’s favorite quote and life philosophy mirrors Mohammed Ali’s quote, “Don't quit. Suffer now and live the rest of your life as a champion,' and in our book Brooke is already a champion on and off the field.